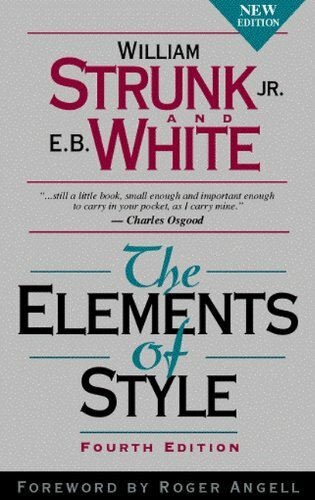 I’ve just finished reading “The Elements of Style” by William Strunk Jr. and E.B. White; a classic most people recommended me in writers forums if I wanted to be a writer. Anyway, I found it brilliant. The book went straight to the point. I can’t believe Mr. Strunk Jr. wrote it so long ago (1919 to be precise) and its contents are still applicable today. Of course, E.B. White updated it later, but still the foundations were already there. This is the first “Style” book I actually read from start to end. I have consulted others, but only for specific topics. Now, I’m considering in going over this book again as soon as I enter into the third revision of my novel manuscript; just to make sure I remember all the words that I’m not supposed to use, the ones that are ambiguous, redundant, or just plain bad english. I felt good knowing that I’ve already eliminated most words from my writing, but at the same time, there were still many others in the book I was not aware of, or just some rules I had forgotten. Like this style book, I still plan to review other books that people have advised me to read. I’m currently with “On Writing” by Stephen King (I’ll let you know my comments when I finish it). I feel like I am acquiring more knowledge and experience. I love the process. When I started to write, I believed it was all about inspiration and great ideas. A little part is about that, but little. It is more is about hard work and perseverance. And you, have you read any style/grammar book to improve your skills? I would like to know if you have any books you can recommend me. I’ve heard of this book before. I really need to get around to reading it. I’m looking forward to hearing your thoughts on On Writing. Another book I keep hearing about that I haven’t managed to read yet. One of the many….